Besides leopard, camouflage is definitely my next print of choice. It’s a great way to add some badassness to your look – yes I just made that up. The great thing too about this print is that you can wear it all year round because it’s a timeless. It’s that kind of print that despite it not being on trend for one season, you will get away with wearing it anytime. Despite the actual meaning behind this print – blending in – in fashion the point is to stand out. On the other hand, this print is bold already, so no need to over do it too. 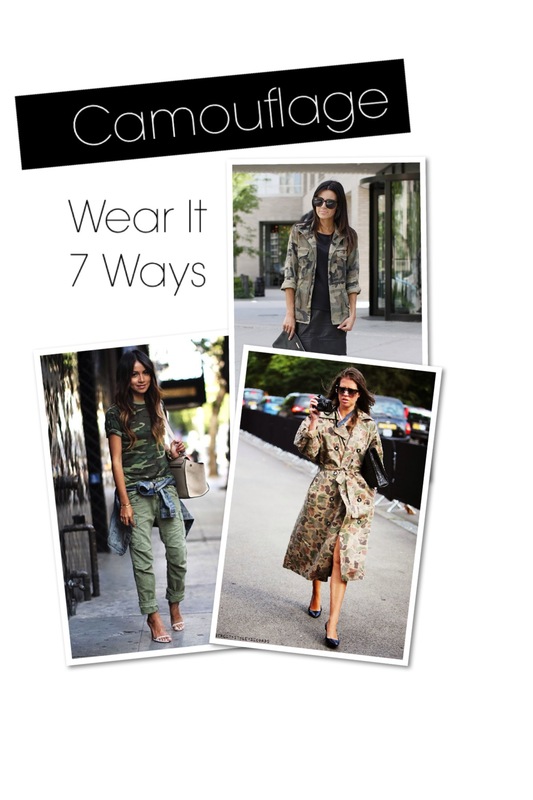 See some looks I’ve pulled to get you in the mood for camo. 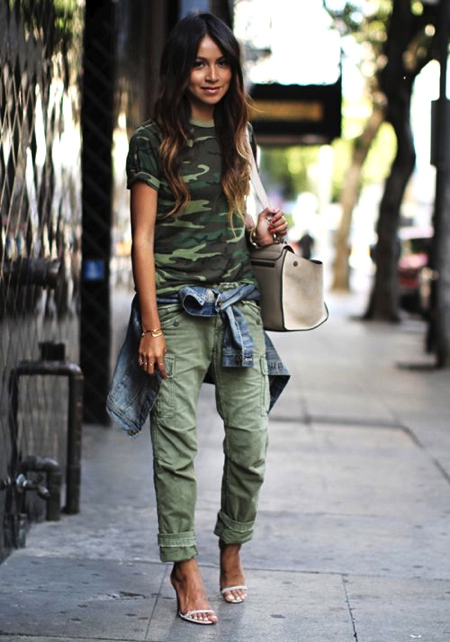 This babe is taking some major risks by pairing her camo pants with metallic platform wedges and we love it! Tip: By rolling the hem of your pants you create a very relaxed vibe in your look. 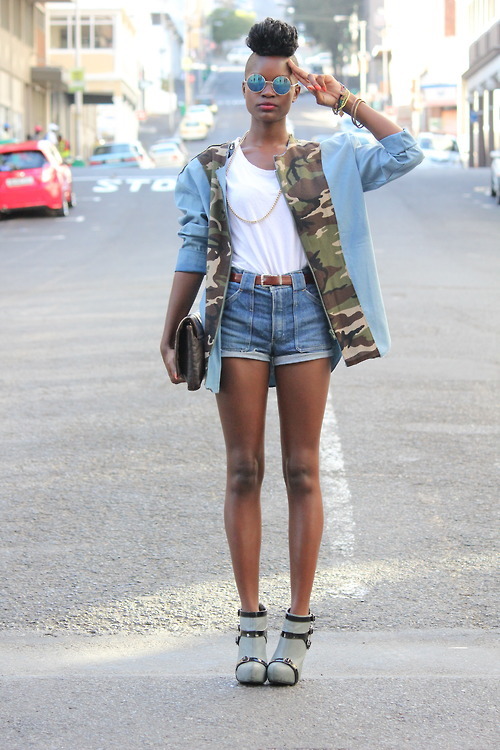 What a way to mix and match: leather mini, pointed toe pumps and topped off with a camo jacket is just too good. When in doubt on how to wear prints, pair it with neutrals: blacks, whites, earth tones etc. Denim is also a great choice as this styler did here. A stand out coat is the perfect cover-up and can be seen to onlookers as your actual outfit. If you’re having an off-day, throw on a great coat and voila – the coat becomes your outfit. This is a great use of just enough print. The camo lined on the jacket is a great accent to complete this look. Another great way to wear your camo is to pair it with some army green. 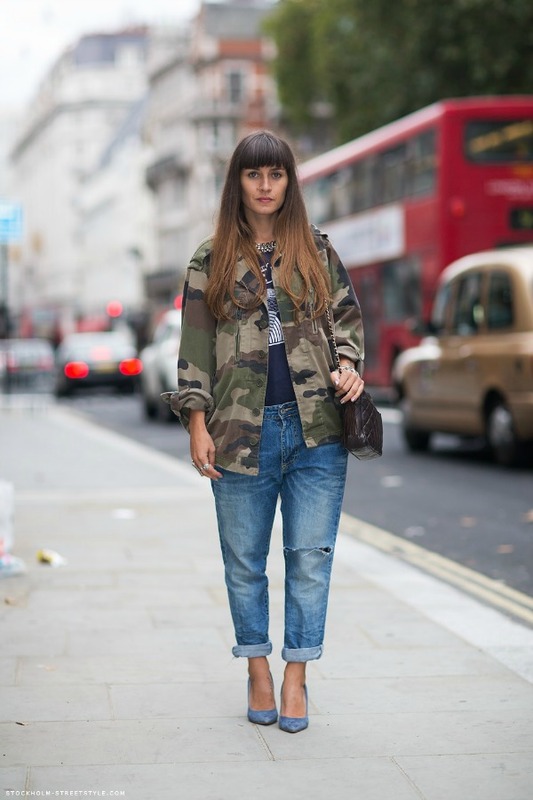 This styler is armed in camo and can’t be beat. Dressing like the boys and still looking feminine I’m all for. If you’re like me and you like to keep your fit on the looser side every once in a while, then this look is for you. To add that feminine touch, slip on some pumps and get on your way.